TBFacts.org has more about the different types of drug resistant TB. The South African National Department of Health implemented its first drug resistant TB management programme in early 2000. The guidelines required that all the drug resistant TB patients should be hospitalised for at least the first six months of their TB treatment. The first definite figures of drug resistant TB came from a national survey carried out in 2001-2002 which showed that although the absolute numbers were small, in most of the provinces there were some TB patients who were already resistant to the four main TB drugs, isoniazid (INH), Rifampicin (RMP), Ethambutol (EMB) and Streptomycin (SM). 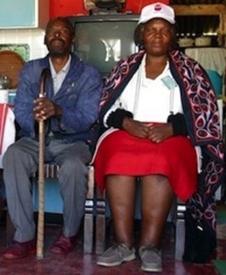 In 2005 South African and US clinicians and researchers identified a large number of cases of an almost untreatable type of TB at the Church of Scotland hospital in Tugela Ferry, a rural and extremely poor part of KwaZulu-Natal. The XDR TB, as it was called, occurred among HIV infected individuals and it was resistant to almost all the anti TB drugs available in South Africa.5“Tugela Ferry, KwaZulu Natal, South Africa” ysmwebsites.trafficmanager.net/intmed/global/sites/southafrica.aspxThere is more about XDR TB at Tugela Ferry. and poor adherence to treatment. As some patients were hospitalised for a considerable period of time, long waiting lists developed for patients needing to be admitted to the centralised units. A number of patients died before starting treatment. In addition delays in starting treatment meant that more family and community members were exposed to infectious and untreated patients. What is meant by the decentralisation of services? Decentralised management of drug resistant TB, refers to the transfer of responsibility for treating MDR TB patients, to a lower level of the health system on condition that they meet certain criteria. It includes the management of drug resistant TB patients in decentralised drug resistant TB units, satellite multi drug resistant TB units, or in the community using mobile teams and community caregivers and households. Which patients would still be admitted to hospital? Patients with MDR TB who have tested smear negative and who were TB culture positive, would no longer need to be admitted. Patients with MDR TB without extensive disease, and who have tested smear positive should be admitted until they have two negative smear microscopy results. Very sick patients with MDR TB and with extensive disease and XDR TB patients, should be admitted until they have two consecutive TB culture negative results. "People lose so much during the treatment phase. They lose an income, they lose relatives, and sometimes spouses. Taking treatment closer to home is the best option. After 2011 the number of MDR and XDR cases continued to increase with 15,419 and 1,596 patients respectively diagnosed in 2012.11Churchyard, G., Mametja, L. “Tuberculosis control in South Africa: Successes, challenges and recommendations”, South African Medical Journal, 104(3), 244-248. doi:10.7196/samj.7689 The treatment success rate for adult MDR and XDR TB remained low at 42% and 18% respectively for those diagnosed in 2010. The MDR TB programme has continued to face many challenges including a high initial loss to follow up of patients; inadequate bed capacity; poor infection control and limited availability of appropriate second-line drugs. Assuming adherence to national drug resistant TB management guidelines, the per patient cost of XDR TB in South Africa has been estimated to be $26,392, four times greater than MDR TB ($6,772) and 103 times greater than drug sensitive TB ($257). Despite drug resistant TB comprising only 2.2% of the case burden, it is estimated to have consumed approximately 32% of the total estimated 2011 national TB budget of US$218. But it is still said to be underfunded. "It is grossly underfunded. Not enough money is put into research, innovation, implementation. The fight against TB is struggling." "We are not doing well with TB; we are failing. As much effort as had been put into fighting HIV was needed to combat TB. With HIV, we know how transmission occurs, we understand how it spreads but we have no idea what happens with TB, which has been around for much longer.